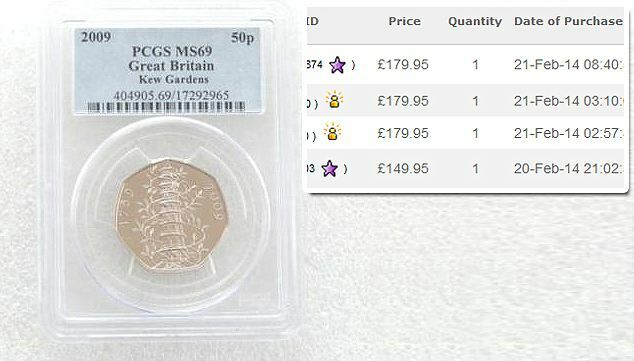 Rare Kew 50p coin selling for �180 on eBay :: Boffer Ecommerce News! Next time you have a 50p coin in your pocket, don`t be too hasty in spending it! Some examples of a rare 50p coin are being listed at £495 on eBay and several uncirculated pieces have been sold for £180, thats 360 times the coins face value. The commemorative coin was made just five years ago with a limited run of 210,000 to mark the anniversary of the Royal Botanic Gardens at Kew. Royal Mint says around one in 300 people are likely to have the coin, so you could be one of the lucky ones. 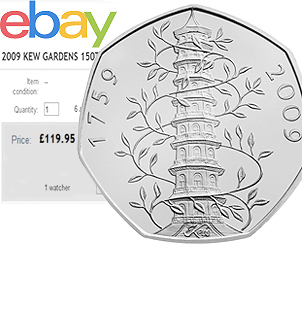 eBay gives 400 search results for Kew 50p coins, with asking prices decreasing quite steeply from the speculative £495. A number of sellers have a high volume of bidders who are looking to snap up the coin starting at a far lower cost. London Coin Company have three left in stock, having sold four at £150-£180 so if you were lucky enough to find a couple of these coins you could make a lovely profit. A spokeswoman at the Royal Mint said that while the face value of the coin is 50 pence, ‘what it is worth to collectors is another matter’. So if you have a 50p that looks like the image below, do not spend it! Instead get it listed on eBay as soon as possible and make yourself a great profit and a coin collector very happy!